The centre piece of a garden in Newport, Rhode Island in the USA is a feature that would look perfectly at home in any garden in Britain. When Angus Davis decided to add the feature in the garden of his home, built during the reign of Queen Victoria in 1854, he wanted a quintessentially British feel. 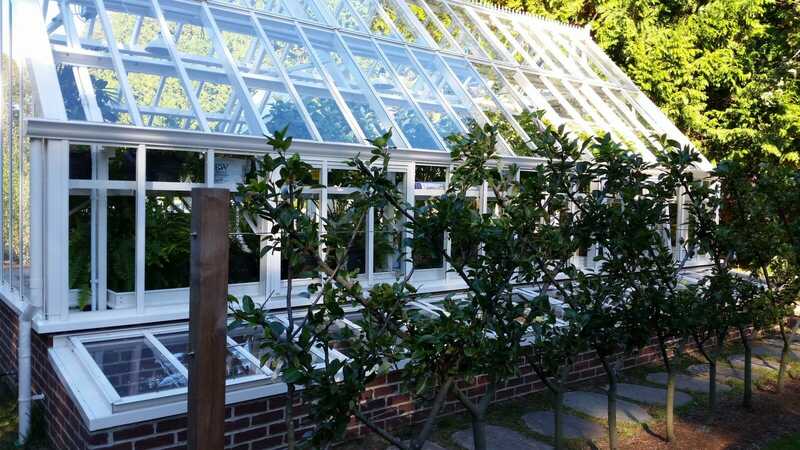 His first port of call was to contact Griffin Glasshouses, whose reputation for creating bespoke greenhouses in the Victorian style had already reached America. Detailed negotiations with Griffin’s managing director, Linda Lane, started in September 2017. 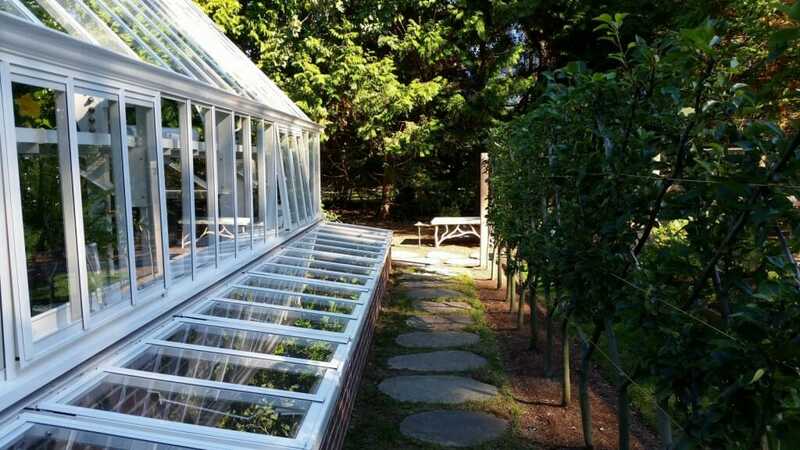 His “Victorian” greenhouse was built at their factory in Hampshire and shipped out to Rhode Island where it was erected by a team from the UK. It measures 4.3m x 7.9m with a full porch and double doors. The ridge is made up of short fleur de lys crestings, with ball finials on both ends. Linda said: “Because of the risk of hurricanes and high winds that are not uncommon on Rhode Island, the greenhouse is supported by a steel sub-frame. The maintenance free aluminium frame is finished in cream and inside features a blend of fixed and folding Victorian style benching and shelving. There are cold frames running the length of the greenhouse on the south facing side. Rain water is collected by discreet drainage off the roof and flows into an underground water harvesting tank that can be pumped back for use in the greenhouse. Angus wanted to complete the “Britishness” of his greenhouse and commissioned London Mosaic to create a Victorian floor tile design. London Mosaic has been in business for almost 20 years, initially working on Victorian tile restoration projects. They have developed a unique sheeted tile service which was also used in Rhode Island. The final touch was the garden furniture and Angus contacted the bespoke manufacturers Andrew Crace. The furniture that went to America is from Andrew’s Indian Lattice collection. “The collection was designed to use the traditional Indian detail and combine it with English Victorian furniture to produce a garden range reminiscent of the British Empire and the Raj,” explained Andrew. The Indian Lattice furniture was created by Andrew after a visit to India and Nepal in 1984 and is one of his earliest designs after starting his business. He has recreated furniture for both the National Trust and English Heritage. “Angus is absolutely thrilled with his “little bit of Britain” and never tires of showing friends and visitors his very unique garden feature,” adds Linda. For more information about Griffin Glasshouses, please visit www.griffinglasshouses.com.